MediaCrooks: Zia Haq of Hindustan Times, Is Christmas Evil ? Zia Haq is an Assistant Editor at Hindustan Times. Some of Zia Haq’s recent articles on his blog at Hindustan Times lament discrimination against muslims. These are 'I can't go to the US, My name is Haq' and 'Rahul Gandhi punished for plain speaking'. This is my response to him and I start with the latest of the two posts.. This is what he wrote: “Imagine. If a politician and a foreign diplomat on a flight were to discuss terror, without anyone hearing them, and the politician does some plain-speaking in the process, is it treachery? Obviously not, unless the diplomat had other intentions.” Oh really? I am no politician or diplomat or even a professional journalist, but usually tips and insights into a person’s thinking come from casual conversations. In this case a US diplomat was picking into the insight and views of a person who could well be PM one day and his beliefs could well dictate policies of this nation. You’re a journalist! Don’t you as a routine practice pick up tips and information on behind-the-scenes goings-on from such casual conversations? Rahul Gandhi’s utterances are not treachery by any means and no one is calling it that. It is just one more of his stupid utterances in a very long list. If Rahul Gandhi really means what he says without political motives ask him to stand up in a debate and tackle the issues. Do you think he is capable of that? To all the other things you have written let me respond in general. If indeed the RSS is the equivalent of SIMI and other organisations such as VHP, Bajrang Dal etc. pose a terror threat then let the UPA show the courage to ban them just like they have banned SIMI. Also, I am all for a ban on an outfit like Shiv Sena, a party that routinely disrupts life and creates nuisance for ordinary citizens. I am also for a ban on any party that moralises people on Valentines Day, that protests books on Shivaji. I am also for a ban on Ram Sene and the like that tell women where they should go and not. Especially, when any violence is involved. I am also for a ban on the Deoband Muslim organisation that tells women jeans are bad and what clothing is pious or lectures on the choices of contraceptives. Will you support all these bans? Let these organisations be banned and let them rush to the courts. Let the courts decide if the bans are justified and fair. Mind you, it is not as if the RSS has not been banned before with the courts having overturned such bans. Don’t fool yourself and others by lamenting that only muslims are painted as terrorists. If you still can’t see why, then your journalistic eyes are truly blinded. The Islamic Terror attacks and the muslims who commit them swear by their religious scripts and such violence is routinely encouraged by many Imams across the world. Do you want proof of this? Furthermore, it is an established fact that muslims owe their allegiance first and foremost to their religion, their Ummah and not to the nation they are citizens of. Indian muslims, by difference, are not immigrants and are historically people of the soil. I will happily say that most Indian muslims are not terrorists. Those who are, are just a handful of them. Are you expecting terrorists in any society to be a huge majority in any community? Then the closest examples you can find any day of such a society is Pakistan which kills minorities everyday, or Iraq or Iran or Egypt. By bringing up the terrorist angle to these arguments you are conveniently overlooking a very disturbing fact and truth that Muslims have become, or traditionally were, the most intolerant of other religions and other communities. Here is Christmas celebration for you from the Daily Mail. Can you explain that? Or once again these are people who are not muslims? Or once again these are people who have 'hijacked' or 'misunderstood' Islam? Mind you, Tower Hamlets is one place in London where the head of the local council is Lutfur Rehman, a muslim. 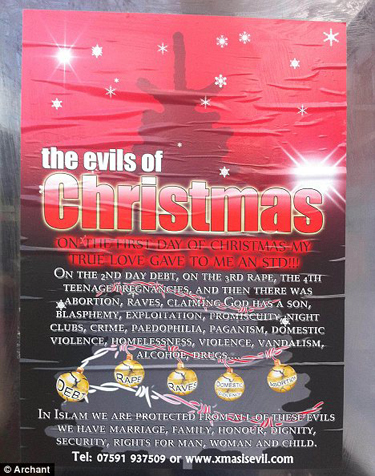 Although he denounces the poster, can we really believe this could have happened anywhere else? Do you see violence on the streets of Britain because of the poster? You might well say ‘oh that’s in Britain, it’s got nothing to do with India or Indian muslims’. If that would be an argument, can one explain violence and deaths over the Danish cartoons? There is a minister in UP who declared an award for the head of the Danish cartoonist. Can you explain why this man who incited a criminal act is not in jail? Can you explain the violence in India by muslim protestors over the US invading Iraq? Protests one can understand, but violence? Whatever the cause of terrorism, religious terrorism is the outcome of religious intolerance. And intolerance is not just in terms of violence, it comes in many other forms too. Can you imagine the consequences across the world and in India too, if such a poster were to appear about Idd? Can you honestly answer that question? In your post on being denied a US Visa you have complained about being singled out. Can you explain how and when travellers from across the globe had to start to go through severe security checks, have to reach airports hours and hours before their flight, have to remove even shoes and clothing, have to go through body pat-downs? Can you name one Imam who has condemned terror acts by Islamic terrorists? If you can, I will send you a list of 5 for each Imam you name who have actively encouraged Jihad attacks. You’re not being singled out to deny a US Visa. It is called ‘profiling’. The Hindu points out more such cases in your defence. And what is wrong with that? Should the world continuously risk threats, intolerance, inflammatory speeches because democracies provide that freedom? Recently, a flight had to be aborted because a muslim wanted to do prayers in the aisle. Can you assure me no muslim would do that? Will you do such a thing? How many Hindu shoe bombers have been arrested? Have many Hindu Major Nidals (of the Fort Hood massacre) have been found? Here is another challenge to Zia Haq : Can you explain or justify the brutal killing of Theo Van Gogh? Would you like to debate or argue with Geert Wilders when he equates Mein Kampf with the Koran? If not, don't defend Rahul Gandhi's equation of RSS with SIMI by any yardstick. Given that you’re a journalist, you may not be blind to the many emails and websites that Islamic terrorists have offered all of us. How many such sites and emails by Hindu or Buddhist or Christian terrorists can you point out to me? How many such emails or sites that threaten India or any other country or community can you point out by the RSS, VHP, or any such outfit? Do you have a record of all the statements or utterances of Hindu leaders or organisations which have condoned the attacks at Malegaon or Ajmer or any other places which have suffered terrorist attacks? Most journalists confuse issues of terrorism by merely citing what the BJP or the Congress is saying. They, like politicians, have lost touch with ordinary citizens. The media may have its reasons to indulge in political correctness, but citizens do not. One can judiciously call terror as ‘religious’ terror if and only if its religious scriptures or its religious leaders are actively promoting, encouraging and applauding terror. There are endless number of muslim Imams and political leaders who encourage and applaud terror. The terrorists themselves quote religious scriptures. Pray, tell me what Hindu scripture, Hindu leader or Hindu doctrine encourages such violence. If you find one, I will be the first one to support destroying that scripture and putting that religious leader in Jail. Can you do the same for muslims, Mr. Zia Haq? That is where Rahul Gandhi is wrong, both in his utterances and his idiotic diplomacy. I agree 90% with this article. I can understand the ignorance of the lay muslim in India or other Muslim countries whose outlook is limited and are not exposed to the events happening in the world. As a result, they tend to believe with complete faith whatever information they get from the few sources such as their immediate family (just as ignorant) and their mullahs. But I am really shocked at the article by a seasoned journalist of such a reputed newspaper. Of course, it only goes to show how denigrated our journalists are. Once cannot agree or sympathize with you more. One must always keep in mind that double-speak is a standard practice of Muslims against non-Muslims. It is very adept and timely of you to point it out as well. Good stuff man. Keep going. But then with people like Haq, do not waste your time. Excellent piece. There is one more such writer by name Seema Mustafa. She thinks that she can take tuition classes to the whole nation on how to find faults with national policies. A most prejudiced journalist. The general belief is that the cause for violence and loot is the wide spread illiteracy. The people who indulge in violence on the streets are people who are not gainfully employed and with no three ‘Rs’ regardless of religion. I had to change this idea after seeing innumerable number of educated and well read muslim people taking into terrorism. Haq should repeatedly read Noorani’s ‘where Indian muslims have gone wrong’? "There are end number of muslim Imams ..."
Didn't you mean 'N number of' ? Doesn't look like a typo to me. I am in agreement with you on most of the points. today was a nice day to revise this article of yours. on a specific question on islamic terror, rahul baba comes up with hindu terror in response. hindu terror, even if it exists was not the question posed to him. this shows the iq level of a person who also happens to be a prospective prime minister of this country. its like someone asking me: whats your name and i reply sir, i stand 5 feet 8 inches above sea level. justification of violence is as good as the act of violence itself. intolerance is what islam teaches. they have a separate rule book for each act under the sky. and the biggest tragedy is that they expect even the others to follow that rule book. first they'll fight with people of different religion and then within their own religion. basically they are so used to violence that they are scared of peace. i often wonder if the shias and the sunnies refer to the same quran, if yes, why the hell do they fight amongst themselves. the other day i read an article in "the dawn" where someone declared emails and twitter are haraam. this is a religion which is interpreted by each expert on this religion as per his own convenience. i'm sure the prophet would be having no clue what an email or twitter was. so one nerd declares it as haraam and we will have hundreds of nerds following him and ready to kill for the cause.